St. Isabel Catholic Church, of the Diocese of Venice, Florida, is located on Sanibel Island, a barrier island near Fort Myers, on the Gulf Coast of southwest Florida in the United States. From its simple beginnings to the beautiful island landmark it is today, St. Isabel’s has been a cherished place of worship for Sanibel’s residents and countless visitors from all over the world. In 1956, His Excellency Bishop Joseph P. Hurley has the vision and foresight to buy a tract of land on Sanibel Island. The twenty acres was what would eventually become St. Isabel Catholic Church. When the island was connected to the mainland by a causeway in 1963, a newspaper clipping invited residents and visitors to attend the informal, outdoor Masses being held on the island. The little mission of St. Isabel grew quickly and soon it was time to provide a larger facility for Sunday worship. On May 7, 1963, Msgr. Robert Schiefen, who was the chancellor for the Diocese of Miami at that time, applied for assistance for the construction of a mission chapel. Subsequently, and $11,000 grant was received, and permission to build the original St. Isabel’s was given – a structure built for a total of $35,000. On June 19, 1965, the Rt. Rev. Coleman F. Carroll, Bishop of Miami, dedicated the new church. The mission parish of St. Isabel continued to grow, and parishioners expressed a desire to build a rectory and have a resident priest. In 1974, Fr. Beauregard was named the first administrator and the thriving St. Isabel Church rapidly grew from 9 families to 90 families. In the years that passed St. Isabel was not the only entity flourishing. The population of southwest Florida grew exponentially, and in July of 1984 Rome announced the creation of a new diocese – the Diocese of Venice. The Most Reverend John Nevins, an auxiliary Bishop of Miami, was chosen to head the new diocese. In the meantime the parish of St. Isabel continued to expand, experiencing several renovations and additions to the worship space. On April 23, 2003 Fr. Christopher Senk arrived as Administrator of St. Isabel Parish. The long time residents, parishioners and visitors of St. Isabel Parish welcomed Fr. Senk to its close-knit faith community as renovations already underway were completed. Fr. Senk embraced the task of getting to know his St. Isabel congregation, a congregation with dramatic seasonal changes due to the comings and goings of his active parishioners, as well as visitors from around the world. Everything changed for the parish of St. Isabel when on Friday, August 13, 2004, Hurricane Charley ripped through the islands, causing significant damage to the church. While the rectory and church hall suffered minimal damage, large portions of the church’s new roof were blown off, causing serious water damage to the newly renovated space, effectively making it unusable. Miraculously, all of the stained glass windows survived the hurricane’s wrath to be used in the structure’s eventual reincarnation. Once back on the island, Fr. Senk, the staff, and more than a handful of volunteers began to salvage what they could and moved the church to the church hall. A small group of parishioners were present when the first Mass after the hurricane was celebrated in the church hall on August 22. A second collection for the rebuilding of St. Isabel began on that day. Eventually, a formal Building Fund Drive began in March 2005 with a goal of 4.75 million dollars. Already immersed in the church’s post-hurricane recovery, on April 17, 2005, Fr. Senk was officially installed as Pastor of St. Isabel Church. Major demolition of the damaged church began in the summer of 2005, and in the summer of 2006 it was determined for safety reasons that the office section of the church needed to be included in the renovation plans. The funds to cover the increased costs of the office renovations were quickly raised and donated without hesitation. The rebuilding of the church was arduous task and Fr. Senk was blessed with parishioners who supported his vision financially and with complete confidence and trust. Circumstances not allowing time to establish a formal Building Committee, the majority of the decisions fell on the shoulders of Fr. Senk. With support of staff and parishioners Fr. Senk also had to orchestrate the delicate dance that regularly took place between Diocesan officials, contractors and the Sanibel bureaucracy. After three and a half long years, Fr. Senk and the parishioners of St. Isabel celebrated the first Mass in the newly refurbished space on March 19, 2008. While there were many things that still needed to be finished, celebrating the Scared Triduum and Easter in the new space was a priority. A reception followed the Mass in the Church Hall and parishioners were ecstatic that their rather long and patient wait was rewarded with a such a beautiful space. On April 11, 2008, improvements to the outside of the Church commenced. Fr. Senk was always insistent that the “religious” experience begin for a visitor to St. Isabel when they enter the property. With the support and generosity of parishioners, St. Isabel embarked on an extensive landscaping plan that included the planting of thousands of new trees and shrubs, the moving of others, and the establishment of garden ares with religious art by well known liturgical artists. St. Isabel Church is recognized by parishioners and visitors as one of the most beautiful small churches in the Diocese of Venice. So much has changed from the beginning of St. Isabel Church. The island has grown and flourished, and the Parish of St. Isabel has grown from its original nine families to over 600 registered households. The generosity of the parishioners has been unwavering, even during the “hurricane” years, and there has never been a year when St. Isabel did not make its annual Catholic Faith Appeal assessment (annual appeal by the bishop for diocesan funding). In spite of the eventual six million dollar price tag for the rebuilding project and landscaping, St. Isabel has not carried any debt over the last 14 years. However, even more important than the rebuilding of a physical church, under the leadership of Fr. Christopher Senk the congregation has built itself up into the kind of loving and caring family that churches are called to be. In Fr. Senk’s fourteen years at St. Isabel’s, parishioners have truly come to care for one another, often reaching across economic lines to help or socialize with people they might never have had the chance to meet. Under Fr. Senk, the St. Isabel’s Women’s Guild has expanded and been revitalized, doing more and more for the church and its surrounding community each year. Inspired and guided by Fr. Senk, St. Isabel’s Church has established its own Men’s Society. In the past four years since its formation, this ever-increasing membership has been a significant presence in both the church and the community. Together, under the leadership of Fr. Senk, these groups at St. Isabel, and the church’s membership as a whole, is a force for good in the local community, having a great impact on the local Catholic Charities and on the Pregnancy Clinics doing their good work. St. Isabel Church is justifiably proud of the place it fills in the larger Catholic community. With God’s help, and Fr. 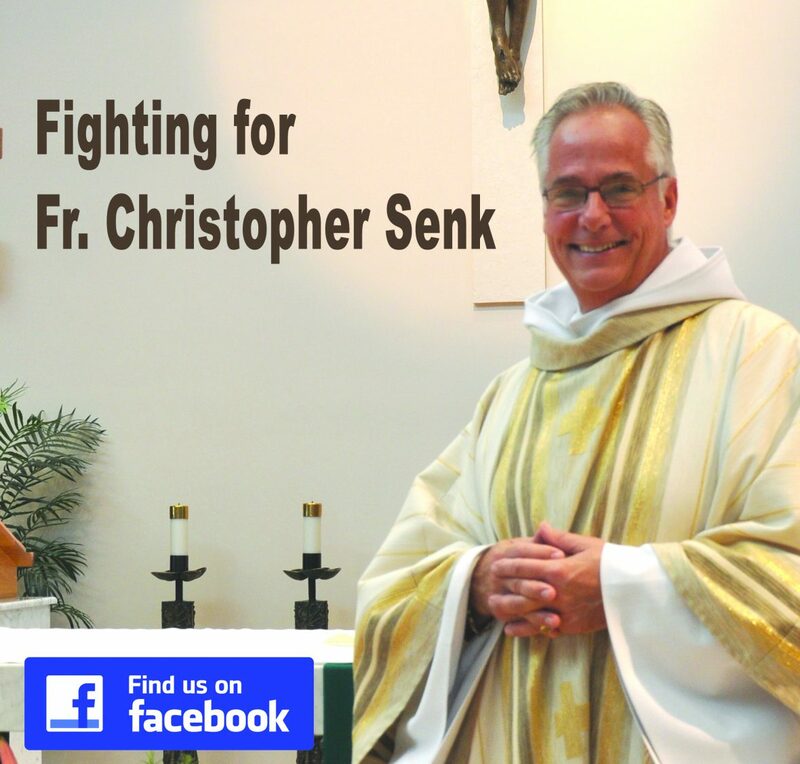 Christopher Senk’s guidance, may it continue to flourish in the future.